Deciduous forests of the eastern highlands cover roughly 44% of the state. While the northern and southern parts of this east-central state are hilly forests, the central region is a fertile plain. The far edge of the great Indo-Gangetic plain occupies the north. The Rihand River, a tributary of Ganges, flows in this northern part of Chhattisgarh. 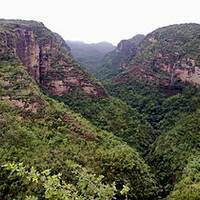 The Satpura Range of mountains and the Chota Nagpur Plateau come together to form an east-west belt of hills that divide the Mahanadi river basin (central region) from the Indo-Gangetic plain in the north. The central part of the state lies in the fertile upper basin of the Mahanadi River and its tributaries making it a fertile region for extensive rice cultivation. The upper Mahanadi basin is separated from the upper Narmada basinin the west by the Maikal Hills, part of the Satpuras, and from the Odisha plains to the east by hill ranges. 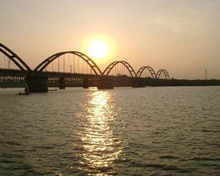 The southern part sits on the Deccan plateau in the watershed of the Godavari River and its tributary the Indravati River. Mahanadi is the prominent river of the state. The other main rivers are Hasdo, a tributary of Mahanadi, Rihand, Indravati, Jonk, Arpa and Shivnath. The outline sketch of Chhattisgarh looks like a sea horse. The state animal is wild water buffalo. The state bird is hill myna and the sal tree found abundantly in Bastar is the symbolic emblem of Chhattisgarh. 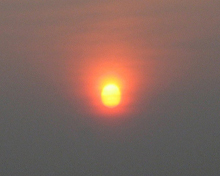 The climate of Chhattisgarh is hot and humid as it is tropical in nature. The region falls close to the Tropic of Cancer and hence, experiences extreme temperatures. In summer, mercury even touches 45 degree Celsius and monsoon season begins from late June to last till October, thus offering a welcome relief from searing heat wave. Chhattisgarh receives an average of 129.2 cm of annual rainfall. Winter along with chill winds starts from November and lasts till January which is the right time to visit Chhattisgarh. The winter season is pleasant with low temperatures and less humidity. The average mean temperature varies between 30 and 45�C in summer and between 0 and 25�C during winter. Chhattisgarh is rich in mineral wealth, mainly iron-ore, coal, bauxite, dolomite, limestone, tin, gold, diamonds and other precious stones. The state has 19% of the country's iron ore deposits. 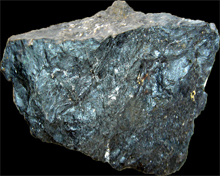 The iron ore deposits at Bailadila mines in Dantewada district is exported to Japan because of its high ferrous content. Nearly 17% of coal reserves of the country are in the state which offers a steady supply of this mineral to thermal plants across the country. Chhattisgarh accounts for 49% of diamond deposits in the country. The state is the top producer of quartzite, and the second largest producer of iron ore, coal and dolomite in the country. Large deposits of limestone are found in Raipur, Bilaspur, Durg and Bastar districts. While nearly 35% of the area is under cultivation, 80% of the people depend on agriculture for livelihood. Rice, wheat and maize are the main crops of Chhattisgarh. 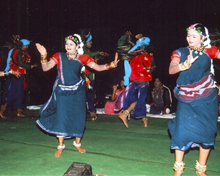 A tribal society with rich culture, most of the areas in Chhattisgarh are yet to catch the attention of the outside world. Some of the remote parts of the state are still inaccessible either by road or any other forms of transport due to thick forests. Hence modernity is yet to make inroads in these tribal hamlets cut off from rest of the society for centuries. But thick forests, wild animals and tribal culture, apart from scenic waterfalls, make Chhattisgarh a state to visit for nature lovers.